Beautiful partially certificate from the Mohawk Rubber Company printed in 1922. This historic document was printed by the Borders Company and has an ornate border around it with a vignette of indians in a canoe and an embossed corporate seal. This item has the hand signatures of the Company's V. President, R. E. Bloch and Secretary, H. H. McCloskey and is over 88 years old. 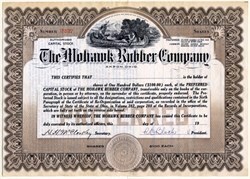 The Mohawk Rubber Company, of Akron, was founded in 1913 by S. S. Miller, Francis Seiberling, J. K. Williams, C. W. MacLaughlin, R. M. Pilmore and F. J. Mishler, with capital stock of $350,000. It took over the plant of the Stein Double Cushion Tire Co., and from an original production of 20 tires a day has built its output to 1500 tires and 2200 inner tubes daily. Sales in 1924 exceeded $3,413,000. In 1925, the officers were S. S. Miller, president and general manager; Fran�is Seiberling, vice president; R. E. Bloch, treasurer; H. H. McCloskey, secretary and comptroller and J. F. Jones, sales manager.